Kaabe Shaw is the new Program Coordinator for the Sunday Creek Watershed Project. He was born and raised in Lima, Ohio, and came to Athens to study at Ohio University. After receiving a bachelor’s and Master’s degree, Kaabe and his family (wife, Amy, and two children) continue to live in the area. Kaabe spent two years in Marietta as the Watershed Coordinator for Duck Creek and two years as Franklin County’s Urban Conservationist before joining the Sunday Creek team. I caught up with Kaabe during his first day on the job. Below is an excerpt from our conversation. Chris Tomazic: What attracted you to the Sunday Creek Project? Kaabe Shaw: I’ve done watershed work in the past at Duck Creek in Marietta. Since, I was the Coordinator there, I knew about Sunday Creek. I felt that the relationship between Rural Action and Sunday Creek was something I wanted to be a part of. 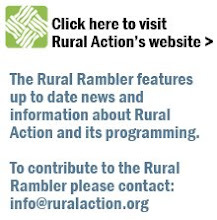 Both groups (Sunday Creek and Rural Action) have been working together for a long time, so they have smooth communications. Plus, I think they do well representing each other in positive light. CT: Do you know much about Sunday Creek? KS : I know the issues they have within the watershed: acid mine drainage, flooding, and a little trash and debris, but the main one’s the acid mine drainage. I know there is a watershed group – Sunday Creek Advisory Group – that’s been around for a while. They've helped to build a lot of volunteer interest. Overall, I feel like I have a pretty good base to start from. CT: What will be one of your first tasks? KS: I’ll need to get together with a lot people in the watershed – be it township trustees, mayors, or residents that are on my committee – and try to build a relationship with them. I’ll try to learn about the watershed from them because they’ve lived here. My goal is to build a relationship for the future, when either they need something from the watershed group or we need some assistance from them. CT: How will your background help you do that? KS: My work at Duck Creek really taught me to work with landowners to find natural solutions to problems – whether they’re getting flooded out, having drainage problems, trash in the creek, or logs falling across the creek. Through education, consistent work, and examining scientific research, I’ve been able to work with landowners to solve many problems. CT: Do you see this position as a step up for you? KS: I do for a couple reasons. First, this will be my first time supervising a VISTA. Second, this will be my first time implementing grants. That’s another reason I’m interested in this watershed. I want to take that next step and not only do the planning and write the grants, but actually follow through. I want to get the projects off the ground. CT: Do you have a message you’d like to get out to the people you’ll be working with? KS: I’ll try my best to improve the water quality of Sunday Creek, but we’re going to need everyone’s assistance. This has got to be a community effort. We already have a nice base of volunteers, but I want to grow that base not only to increase the number of volunteers but also to get a new group of people involved. I hope we can all work towards that goal. Welcome to the team, Kaabe!